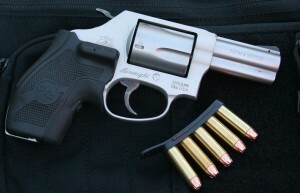 The S&W 637 with the 2.5″ barrel. For more than a century, the double-action revolver has been a personal-defense favorite. Over the years, wheelgun fans have debated the merits of 2″ versus 3″ barrels. Fans of the 2″ like the concealability; those who favor the 3″ extol the benefit of a full-length ejector rod. Good news: Smith & Wesson (S&W) produced a happy medium with a version of its Model 637 revolver that sports a 2.5″ barrel (other versions carry a 1.875″ barrel). The pistol remains a J-frame, but the slightly longer barrel allows a full-length ejector rod. In this article, I report on my test and eval of the 637 with the 2.5″ barrel. The Model 637 is an Airweight double-action revolver built on an aluminum alloy frame with a stainless steel, five-shot cylinder. It’s chambered in .38 Special +P (and of course .38 Special as well). 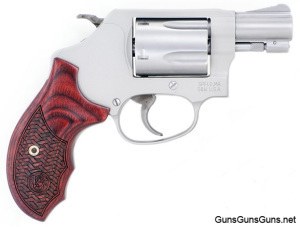 S&W has applied a matte-stainless finish to the steel and aluminum parts. The 637 employs a standard exposed hammer and features a smooth, wide trigger. Lengthening the barrel adds exactly 1 oz. to the empty weight, bringing the 2.5″ version up to 16 oz. The gun features the typical, J-frame style iron sights: The front sight is a notched ramp, and the rear is a square channel cut into the top of the frame. On this particular model, the front sight is pinned in place, and you can easily swap it out for other designs. The 637 can be had in with a number of grip configurations, including short and tall finger-groove synthetic grips, a tall wood finger-groove grip (a Talo exclusive), and Crimson Trace LaserGrips. My gun has Crimson Trace LaserGrips installed. These grips have a pressure activation switch on the belly of the grip and an on/off switch at the heel. For this evaluation, I tested several controlled-expansion defensive loads in standard and +P varieties. The ammunition came from Black Hills, Cor-Bon and Hornady. A left-side view of the 2.5″ 637. For my chronographing chores, I decided to do a side-by-side comparison with an original, 1.875″ 637 and the newer 2.5″ version to see if the additional barrel length makes a difference in the velocity department. The results suggest the +P ammunition did indeed take some advantage of the extra barrel length. How significant that might prove on the receiving end is a matter of speculation. I also found the windage was right on, but the rounds all impacted a bit higher than point of aim (2.5″ high on average). With the basic range chores out of the way, I moved on to more enjoyable, practical exercises. Using a cardboard silhouette and MTM Jammit target stand, I ran though some shoot-move-reload-shoot drills. The 2.5″ 637’s full-length ejector rod ejects spent brass clearly and consistently. 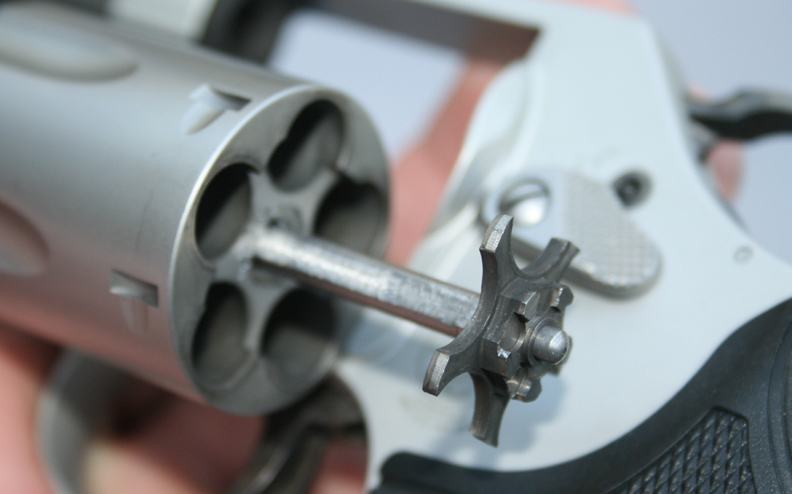 At press time, each new S&W J-frame revolver ships with a Tuff QuickStip. Like other products that came before it, the QuickStrip uses a flexible polymer strip to hold spare ammunition in a line. Ammo strips are great for concealed carry because they fit comfortably in your pocket. Speedloaders, though faster, don’t carry very well in normal pants, shorts or vest pockets. This particular Tuff QuickStrip version held five rounds of .38/.357 ammo. To have any hope of reloading your pistol under stress, you must practice with it. I like to use a shot timer to induce a small amount of artificial stress as well as to measure my own progress. Set your own goals. My goal: Fire five shots center mass, empty the revolver, reach into a pocket for spare ammo, reload it with the QuickStrip and fire five more rounds within 20 seconds. This is not lightning speed, mind you, but practical. Concealed carry is just that. Your firearm and spare ammunition will be concealed on your body, not mounted on some speed rig you wear only to the range. During dozens of reloading drills, I found that every case ejected free and clear of the cylinder. Even after more than 100 rounds when carbon was starting to build up on the frame, none of the cases stuck. Any .38 Special ammo fired from a 16 oz. gun will generate a decent amount of felt recoil. Load that gun with +P ammunition and the recoil impulse becomes downright snappy. There isn’t much to hold on to with a compact revolver. Should you use one hand or two? If you have the time and opportunity to place two hands on the gun, this is always recommended, and I further recommend using one of two methods. Either clasp your hands together and tuck your thumbs down, which will keep your thumbs away from the cylinder and cylinder gap. Or, stack your thumbs as you would with a semiauto pistol. A Model 637 with the 1.875″ barrel. While shooting the 637, I used both two-hand grips. While using the tucked-thumb grip, the recoil from a +P round pushed the cylinder latch back into the knuckle of my right thumb and took a little chunk out of my flesh. I thought I had a pretty solid hold on the gun, but I was running through multi-shot drills. Every person reading this has uniquely shaped hands. How you hold the pistol is a personal choice. I switched to a semiauto, stacked-thumbs grip and did not experience any further issues. I found the new Model 637 to be a high quality firearm, and the Lasergrips are a great addition to the compact gun. When considering a defensive pistol, you must take into account that you may need to fire from awkward, unnatural positions. Lasergrips excel when used from non-traditional firing positions. Bottom line: The 637’s lightweight, compact design with a slightly longer barrel and corresponding full-length ejector gives shooters the best of both worlds. The Lasergrips are icing on the cake. Keep shooting straight and shooting safe. .38 Special +P, .38 Special 5 7″ 2.5″ 16 oz. .38 Special +P, .38 Special 5 6.31″ 1.875″ 15 oz. 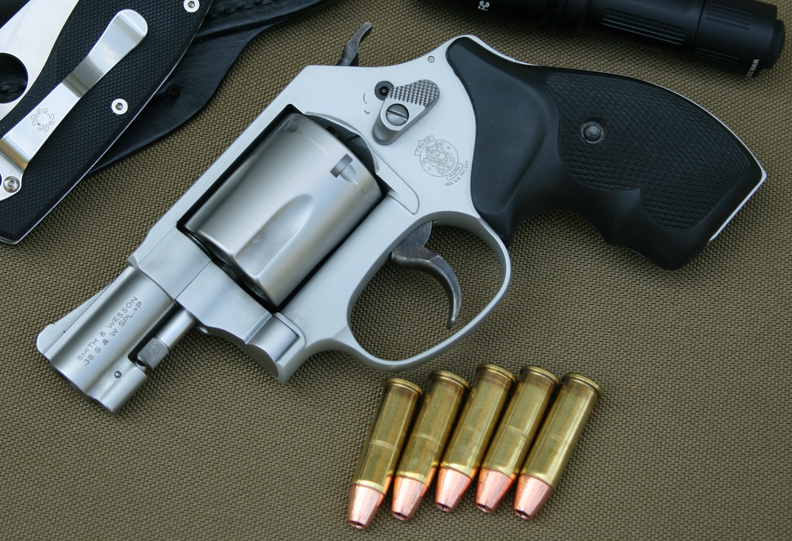 Update: S&W’s Performance Center now offers a version of this revolver it calls the Model 637 Wyatt Deep Cover. The Model 637 Enhanced Action, made exclusively for Talo. This entry was posted in .38 Special, .38 Special +P, $251-$500, $501-$750, $751-$1,000, Compact, Revolver, Smith & Wesson, Subcompact, Talo and tagged Handgun Reviews on August 23, 2011 by Paul Markel. I own several 637’s, one for the daughter, one for the wife, one in my man cave (hidden away). The 2.5″ barrel version is my favorite and the one I carry and shoot the most. Never had a problem with any of them. Can’t go wrong with a Smith & Wesson revolver!